On Mothers' Day, thinking about my mother, who started life as a Danish peasant girl over 95 years ago. She's still going, but not so strong as before. I did a google-image search for "Danish peasants," and found this fascinating piece by Suzanne Bocanegra, in which she translated a weaving pattern into a musical performance. There is a series of photos at the site, as well as an explanation of the translation process. Anything that involves counting in the lower whole numbers, numerical patterns, etc., can be translated from one system to another. Well, I say that rather glibly, not knowing what I'm talking about when I say "anything." But weaving patterns can be transliterated into other forms of gridded figurings-out and then parlayed into another art form. Language too, if you assign numerical values to the letters of the alphabet, as in Kabbalistic methods of composition and wordplay. The surplus of suffixes and prefixes in the title "rerememberer," with the "b" as the only barrier to a pure palindromic reading of the word, functions as a kind of elaborate border around the core letters "memb," which can be in turn elaborated into other words like member, membrane (the connection with tissue and cloth here is obvious), remember, memorial, ember (the glowing core of a word, process, emotion, energy that is either dying or coming to life), and so forth. The letter M is "mem" in Hebrew, and signifies water. The letters on either side of the core hold in the water, the way a membrane holds bodily fluids or a basket, properly made, holds something viscous or even fluid. The way my mother lives in my heart, my heart lives in my body and my mind. I wish there were a visual image of the Danish peasant cloth on which the piece is based. If I were methodical and patient enough, there might be some way for me to reconstruct the pattern retroactively (if I could see the musical score), but I'd not know the colors or the dimensions. And anyway, I am not methodically minded or patient in this way. 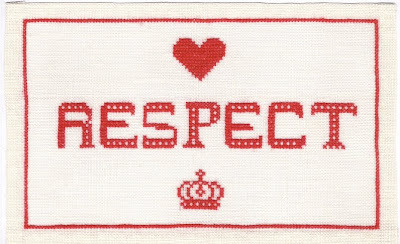 The x-stitch above is one I made for Mother a few years ago, after she said, in response to my query, that all she wanted for Christmas was respect. The crown and heart, as well as the red and white colors, are typical Danish motifs, and, as mentioned in an earlier blog entry, the materials I use are generally Danish, from the Danish Handcraft Guild flower-thread to the pattern-books, from which I got the heart and crown.